Design a specific financial flight plan for your retirement. Protect yourself as we write the next chapters of your future. Maintain your standard-of-living while retired. 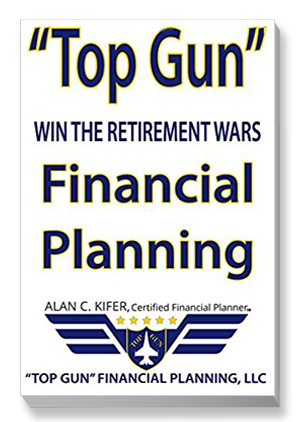 Alan’s new book helps you plan your financial future and live your entire life with independence and dignity. The Baby Boomer population (born between 1946 and 1964) in America alone exceeds 100 million. About 20 million have turned 70 and have begun the process of taking Mandatory Required Minimum Distributions (RMDs) from their Tax-Defined Retirement accounts: IRAs, 401(k)s, 403(b)s, 457s, SEPS. This forced annual liquidation will continue to cause increasing stress to the financial markets. It is a separate yet significant matter to put into proper context with maintaining one’s standard-of-living while retired. Add in the grotesque size of federal, state and local government debt, seriously underfunded pension plans, growing global unemployment: 95 million-plus Americans able to work but with no job, 50 million-plus Americans on food stamps and an epidemic of failed socialistic governments in Europe and South America. There is another bubble burst about to happen. You cannot just survive the next crash but can actually succeed at the business of retirement. This is your first step: seeking competent highly qualified professional guidance. That’s why most want a “top gun” financial advisor. Inside you are going to discover more about America’s first retirement advisor of the year. A 24-year retired U.S. Air Force Top Gun Instructor, a 28-year experienced Certified Financial Planner; a recipient of Ronald Regan’s Presidential Task Forces Medal of Merit; and a recipient of the U.S. Speaker of the House of Representatives Citizen of Merit award. “TopGun” Advisors design a specific targeted flight plan unique to each family to help them navigate the uncertain scary world of retirement. Join the hundreds of other families who wanted a guide who wouldn’t leave them behind: a wingman to protect them as they write the next chapters of their future. Welcome to succeeding at the business of retirement. Certified Financial Planner® and Managing Director of Top Gun Financial Planning LLC. Alan is a retired U.S. Air Force Fighter Weapons School “Top Gun” Instructor Graduate and 1995 International Air Forces’ “Navigator of the Year”. Alan’s experience in the Insurance and Financial Services industry spans more than 27 years. He is a nationally recognized author/speaker on eldercare issues and has served as a licensed /credentialed adjunct faculty instructor for the 3 Top Nationally accredited Financial Services Academic Institutions in the United States.